Choosing to do what is right and making daily choices that honor Rev. Dr. Martin Luther King Jr. should be the aspiration of everyone at the UO. That was the message shared by several speakers at the annual MLK Awards lunch on Jan. 21. Interim President Scott Coltrane and acting Provost Frances Bronet introduced three UO faculty and staff members and four innovation program award winners that were nominated by peers for their demonstration of commitment to helping students and others succeed. “What better way to acknowledge Dr. King’s lasting impact than by celebrating the people on our campus who tirelessly advocate for the same things he believed in,” Coltrane said. Yvette Alex-Assensoh, vice president for equity and inclusion, gave an update to the approximately 200 attendees about the universitywide diversity plan. An IDEAL framework is in process to direct efforts for equity and inclusion and all units, and a forum will occur this spring to invite campus and community input. 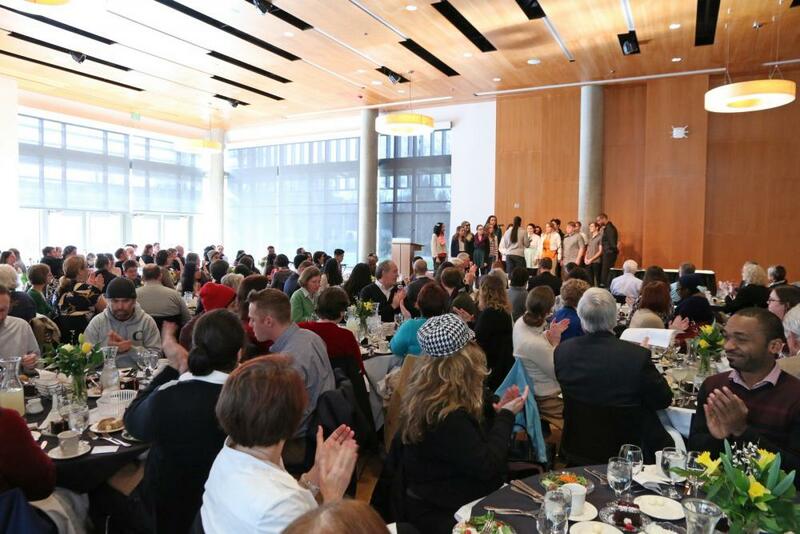 “Each of us has an opportunity to make a powerful difference,” Bronet said as she encouraged colleagues and students to join the Equity and Innovation Award winners. Program awards went to: the Spanish Heritage Language Program, the Summer Academy to Inspire Learning, the UO Libraries Special Collections and University Archives and the School of Journalism and Communication. Daniel HoSang, director of the Center on Diversity and Community, presented the student winners whose class assignments represent the qualities of Rev. Dr. Martin Luther King Jr.
MLK Jr.’s background as a writer and a scholar are examples of how our students and others can “engage, shape and reimagine our world,” HoSang said.